Corey Ford, Managing Partner of Matter.vc, joined the Brown Institute at Stanford on Tuesday Sept. 25, 2018 to kick off the Institute’s fall Media Innovation seminar. Ford discussed key shifts in the media landscape since founding Matter in 2012. “We are at a pretty interesting time,” said Ford, who pointed out that media institutions are under threat both economically and culturally. “Without media ecosystems, we won’t have a strong democracy,” he cautioned. Ford echoes that philosophy and says Matter backs early-stage media ventures and entrepreneurs who are eager to experiment. Matter has launched 73 media start-ups. They have found opportunity in tackling what, at first glance might appear to be tough challenges, be that increasing advertising revenue, reaching more diverse audiences, catching the wave of a new media trend like podcasting, or exploiting new technologies such as Blockchain. 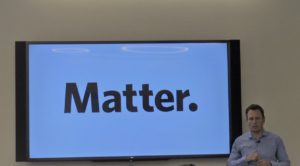 Now raising its third fund, Matter has seen a 1.7X return on investment capital, Ford said. Several portfolio companies have been snapped up by bigger media players including Buzzfeed, change.org, Medium, and Quora among others. Matter’s investors include larger media partners such as KQED, the Associated Press, Google, The New York Times, McClatchy, and the Knight Foundation, among others. While the media companies are out for a financial return, the organizations also benefit from Matter’s expertise in building what Ford calls “a culture of innovation,” often a challenge for large media companies.